Back in high school, there were the super-smart kids who were into science... and then there were the rest of us who dreaded the baffling formulas, the nauseating frog dissecting, and the dreaded eye-wash station. Had we known we’d end up living in some bizarro universe where a growing chunk of the population and our own leaders are denying science exists, though, maybe we’d have tried a little harder. 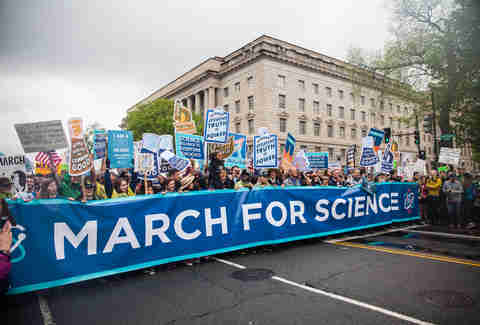 While it may be too late for AP Physics, you can actually still do something important and meaningful in the name of science, like getting involved with the LA Alliance for Science, starting with this weekend’s March for Science. One of 230 marches taking place around the world this Saturday, the idea behind LA's second annual March for Science is to counteract the budget cuts, science-related department closures, and those ever-increasing “alternative facts” that are silencing science these days. Here’s what you need to know about participating in the march and supporting the cause. Where and when does the march start? The march kicks off on Saturday, April 14 at 9am in Downtown LA’s Pershing Square... except it’s not actually a march. Instead, the event will consist of a Science Rally and a Science Expo that will run throughout the day. This way, participants can actually hear from scientists and learn something rather than just yelling while walking with a sign. 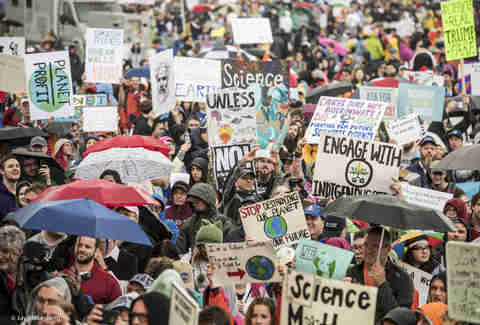 What's the deal with the Science Rally? The rally runs from 10am to 11am, and the roster of speakers is jam-packed with a bunch of really brilliant people who’ll talk about harmful policy decisions; issues facing LA, the country and the entire world; and why we need to call for better science-based policies in the future. Confirmed speakers include John Fleming, PhD, staff scientist with the Center for Biological Diversity; Carlos G. Gutiérrez, PhD, professor of chemistry at Cal State LA; Mona Patel, MD, attending physician at Children's Hospital Los Angeles; Tepring Piquado, PhD, a neuroscientist and professor; and Laura Danly, PhD, an astrophysicist and curator of Griffith Observatory. In other words, get ready to feel like you’ve done absolutely nothing with your life thus far. What about the Science Expo? Science Expo Booths -- focused on science education, communication, policy, and outreach -- will be open all day, from 9am to 4pm, while programming on the Expo Stage will start at 11:30am. Kyle Hill, Science Editor for Nerdist, will serve as MC, introducing short panels and sessions throughout the day with demos and live music in between. Expect topics to cover actionable stuff like what citizens need to know about science, how to get Involved in policymaking, how to inspire LA’s next STEM generation, and making a difference in the world of environmental justice (yes, you). How big will the "march" be? Last year's event attracted 50,000 people; right now just a few thousand have RSVP’d via Facebook that they’ll attend, while another 11,000 have marked themselves as interested, though chances are the numbers will end up closer to last year’s given the current, er, climate. Organizers ask that you RSVP on Facebook or register via Eventbrite if you plan to attend, to help them get a sense of numbers. As always, trying to drive and park in Downtown during a big event is never a fun idea. A good car-less option is the Metro Rail, which you can take to the Pershing Square station, a super-quick walk to the event’s location. While we haven’t heard about Lyft or Uber offering the free rides they did for last month’s March for Our Lives, they’re always a top choice for an easy-breezy ride. You can expect bright, sunny weather on Saturday, which means you'll want to pack sunblock, drink plenty of water, and wear some breathable clothes -- the giant T-Rex suit, in other words, is probably not a good idea. Which social media accounts and hashtags do I use? The national march’s Twitter handle is @sciencemarchdc while LA’s is @marchforsciencela; on Instagram, that’s @marchforsciencela. 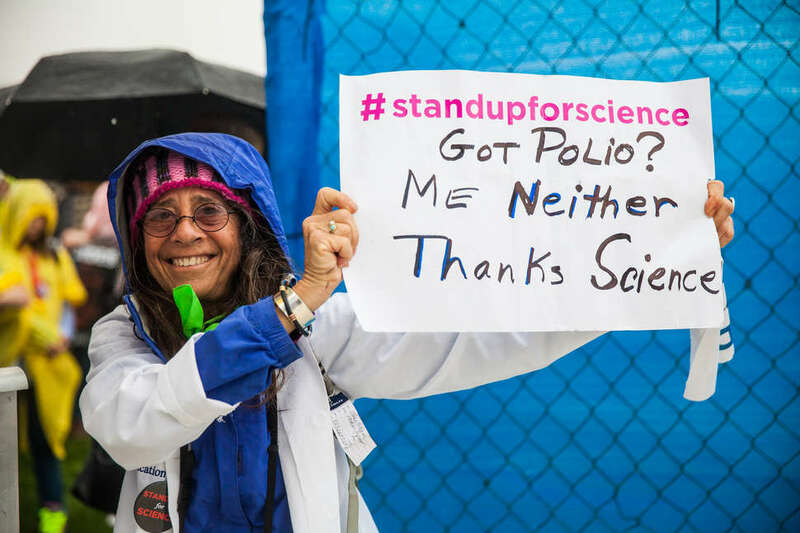 In addition to #marchforscience and #MarchForScienceLA, popular hashtags surrounding the cause include #StandUpForScience #sciencenotsilence and the old classic #science. What about clever, punny signs? 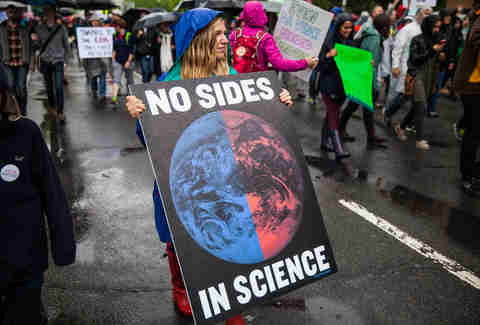 Even though it's not a march in the traditional sense, you should feel free to put together the best protest sign possible; if it's clever enough, you might just spark up conversation with some of your fellow science supporters. Are there any March for Science T-shirts? Of course there are: you can also pick up one or more groovy March for Science LA T-shirt at the rally. Some have astronauts on them, others tout beakers with eyeballs. You’ll definitely wear it again, so it’s totally worth it. What else can I do to support the movement? Make a donation; the LA Alliance for Science is asking everyone to chip in just $5, which we’re pretty sure you can swing. Alternatively, you can sign up for the organization’s email newsletter to keep on top of future events, lectures, and ways to stay involved and volunteer. And if you really want to go all-in, look into becoming an ambassador charged with helping to set up local activities and spreading the word. Lizbeth Scordo is a food and lifestyle writer who is still confused as to whether there are eight or nine planets in the solar system currently. Follow her on Instagram @modlizbeth and Twitter @lalizbeth.